Lectio Divina is Latin for “divine reading” or “holy reading” and there are four lectio divina steps that I will cover in this post. If you have ever wondered about how to pray scripture, Lectio Divina is a great place to start. Lectio is a Christian tradition of prayerfully reading scripture that has been around since the 1500’s, but is every bit effective for deepening your relationship with God as it was when it began over 500 years ago. The intent of Lectio is to both increase your understanding of the Word and nurture a deeper more open connection with God. A well rounded approach to scripture involves what I call both informational and formational reading. Most Bible studies tends toward the informational side of the equation. Informational study is predominantly about getting to know the Bible stories and the principles presented therein. Formational reading involves taking time to encounter the text in a way that shapes us as disciples. One approach isn’t better than the other. In fact, they feed one another. Lectio is a practice that is very much a formational reading of scripture. Lectio: This first movement consists of slowly and attentively reading a scripture passage several times. You may want to jot down words or phrases that seem to stand out to you. Meditatio: In this second movement, as the name implies we meditate on the text. This “meditation” is unlike Eastern meditaion traditions that focus on emptying the mind. Rather instead, the intent of meditatio is to engage with the text with an active mind. For example, you may ponder a phrase or word that arrests your attention in your first readings of the text and sit with it wondering how it speaks to your life right now. You may imaginatively place yourself in the story. All the while listening for the Holy Spirit to speak within you about the meaning of this text for your life write now. Oratio: Oratio is a Latin word associated with speech. It is a word from which we derive words like oral and oratory. In this third movement, speak to God from your heart about what you discover in the text. The Word may convict your heart about something, if so confess and ask for God’s forgiveness. If the Word touches a hurt, you may seek God’s care. If the Word reveals a calling then from you might pledge yourself to God or ask for guidance. Oratio is for you to respond to God. Contemplatio: When all is said and done, lectio comes to an end by simply joyfully resting in God’s presence. We offer back to God our loving focus and attention with a heart full of gratitude. Don’t over think this method or be legalistic about it. The essence of Lectio is slowing down in your reading enough to prayerfully consider what God may be saying to you right now. Chat with God about what you are hearing and then just tarry a few quiet moments in God’s presence. Just prayerfully follow the four lectio divina steps, the Holy Spirit will do the rest. In some ways I have found this form of reading more valuable to my growth as a disciple than my more academic studies of scripture. Nevertheless, I will repeat what I said earlier, formational and informational reading enhance one another. A mature and wholistic study of God’s Word will include both approaches. I hope this post has helped you understand better how to pray scripture. p.s. If you want to pray better, check out my new site that is completely devoted to giving you practical, easy to apply prayer instruction. Click this link to goto TipsOnPrayer.com. I will be printing this out to follow. Thanks for the lesson on study…. I wrote a brief post about lectio divina last August. If you would like to read that post click here. 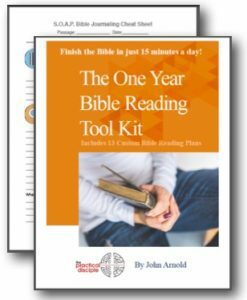 Thanks for mentioning the practice though because your comment prompted me to add a handout to The Practical Disciple Resource Page. I love lectio divina. It has long been a favored practice of mine. I am finding to ideally maximize my growth I need to move back and forth between spiritual reading practices like lectio divina and more academic study approaches such as an inductive study or a classic model of what is referred to as exegesis. My experience has been that an intellectual analysis of a text and a meditative reading of discernment feed one another. I try to balance both but have to confess I lean more toward the latter. Thank you for reading and sharing and may God bless you in your reading richly. Why are these latin terms kept, when we expect immigrants to speak English? and what is the term used ,when a scripture stands out just for you? I am not aware of a specific term for when a scripture speaks to us. If someone out there reading this is please comment. I would love to know one. Regarding latin terms–I have actually seen the practice I referred to using the traditional name ‘lectio divina’ also labeled as divine reading, spritiual reading or holy reading. You can find more information about it googling all of those terms. I am not a linguist, but sometimes words are used in there original language long enough to just become adopted as terms, for example, habeas corpus. Or, some words we simply adopt, for example, ‘amen.’ Amen is actually a Hebrew word that we have simply adopted that roughly means, ‘so be it.’ Why we keep some words and others we do know, I’m not sure I can begin to tell you.